Music is the heart of any musical, and Rock of Ages has a stolen heart. The movie is based on a Broadway show designed with tourists in mind rather than people who actually appreciate stage musicals. It’s a show that plays to nostalgia and provides the comfort of classic tunes so the audience is basically pre-sold: if you like the music, then why wouldn’t you like this music delivery system upheld by the laziest story imaginable? If a musical must rely on other people’s music rather than writing original songs, then the onus for originality falls on the direction. Sadly, director Adam Shankman is hardly up for the task of finding a new spin on well-worn rock favorites, and he’s only able to sporadically bring vibrancy to the film adaptation’s almost non-stop barrage of numbers. In the thinnest premise imaginable, dreamy-eyed Sherrie (Julianne Hough) is headed to 1987 Hollywood with dreams of becoming a singer. Instead, she finds a job as a waitress at the rock club The Bourbon Room a few hours after she gets off the bus thanks to the hunky bartender, Drew (Diego Boneta). The club, run by the grizzled Dennis Dupree (Alec Baldwin) and his sidekick Lonny (Russell Brand), is in danger of being closed down due to lack of funds along with being the target of a moral crusade from the Mayor’s wife, Patricia (Catherine Zeta-Jones). Dennis hopes the club’s salvation will come from legendary rocker Stacee Jaxx (Tom Cruise) despite the machinations of his sleazy manager Paul (Paul Giamatti). Meanwhile, the true-love relationship between Sherrie and Drew hits the rocks due to a star-crossed misunderstanding, and only the power of rock can bring them back together. The story is on the level of a Saved by the Bell episode where Group X needs to save Location Y by holding Show Z. 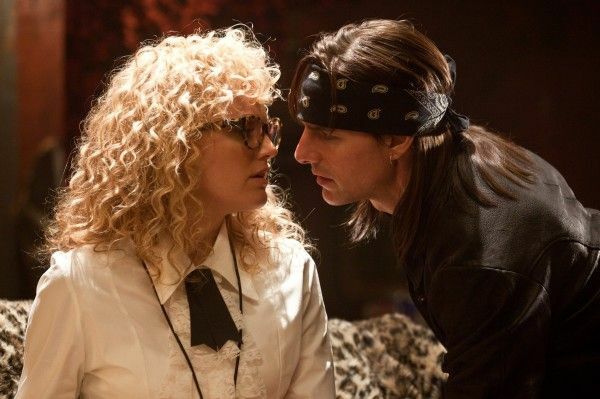 Rock of Ages rests on the lazy assumption that it doesn’t need to tell a compelling story because the movie is a musical and is therefore more about songs than narrative. The film breezes through the non-musical scenes and plot development at an astounding pace. Sometimes a musical number will arise out of a brief conversation, but other times it will happen without even the slightest prompt. The movie’s goal isn’t to tell a story; it’s to squeeze out as many classic 80s rock tunes as possible. This mixtape approach can only work if the director finds a way to make his soundtrack more than a playlist broken up by spurts of dialogue. There are a few medleys sprinkled throughout, but the majority of Rock of Ages is just cover songs. The director’s duty is to take advantage of his visual medium and building a vision around these songs. Instead, he takes Sherrie and Drew’s duet of “Jukebox Hero”, sets it in a Tower Records, and then does basically nothing. He even has extras still browsing the records in the background because apparently rock isn’t powerful enough to distract some people from shopping. When Patricia sings “Hit Me with Your Best Shot”, it’s in the confines of a tiny church. Shankman doesn’t change the lighting, he doesn’t dynamically move around the set, and he doesn’t even use his setting as room for an exciting dance number. So why not stay at home, download the soundtrack, and listen to Zeta-Jones sing the song? Shankman doesn’t bail on all of his songs. When he’s serving the Stacee Jaxx numbers, suddenly inspiration strikes. The cinematography becomes more than just a series of minor pans and zooms. The back-to-back Jaxx numbers “Wanted Dead or Alive” and “I Wanna Know What Love Is” feature an enthusiasm rarely seen anywhere else in the film. There’s energy, emotion, sensuality, and in the case of “I Wannt Know What Love Is”, great humor and chemistry between Cruise and Malin Akerman, who plays a Rolling Stone reporter seduced by the rock god. If Rock of Ages weren’t so busy trying to have more music than story, it would have found a tremendous strength in its supporting characters. Hough and Boneta are bland and forgettable, but the film is more than celebrity karaoke night when it gives time to Baldwin, Brand, Akerman, and especially Cruise, to cut loose and bring some comedy and originality to the picture. No one will walk away from Rock of Ages thinking Cruise is a magnificent singer (they’ll think that about Akerman), but the script goes all in with Jaxx’s multitude of delightful eccentricities. Cruise plays the character with a quiet, withdrawn attitude where he whispers almost every spoken line and hooks us with Jaxx’s detached oddness. But these moments are few-and-far-between because the rock hits are numerous-and-crammed-together. 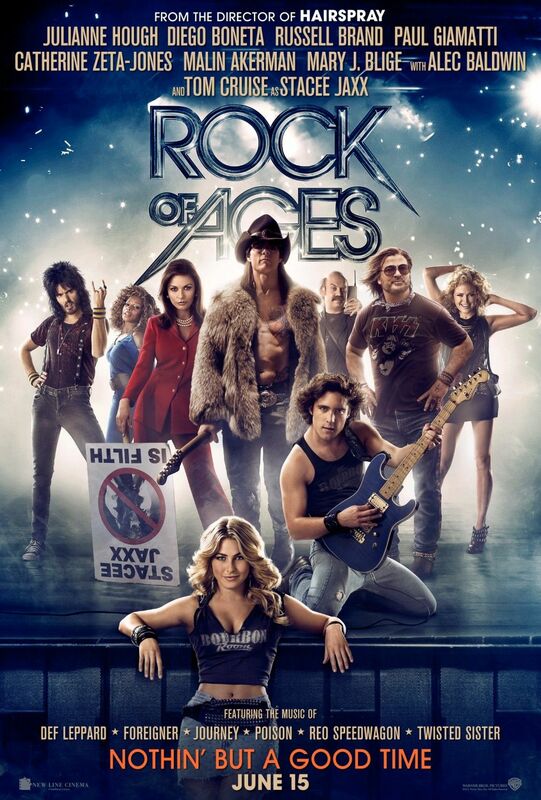 I’m not sure how Rock of Ages works on stage, but it certainly doesn’t work as a movie. Rock should have an element of rebellion, breaking the status quo, and pushing the envelope. Rock of Ages is a chaste, soulless enterprise that drains the music of what makes it special, and reduces it to a series of cover songs. There’s a difference between simply singing the words of a rock song and actually getting to the heart of the music, but Shankman’s film is unable to tell the difference.